New York City is highly vulnerable to a hurricane strike due to its location near the coast where winds and storm surges are usually at their maximum. On one hand, we are fortunate that direct hurricane strikes are extremely rare – four hurricanes have struck NYC since 1600. On the other hand, residents have been lulled to complacency by this recent long period without a hit. Storm surges in these hurricanes were 10-13 feet, which flooded about half of Manhattan below 34th Street and large swaths of East Harlem, Queens, Brooklyn and Staten Island. 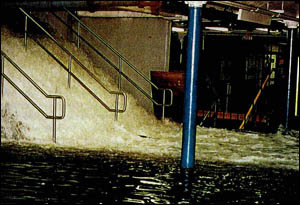 Flooding in the Hoboken PATH station during a 1992 nor'easter, which shut down the entire NYC subway system (Metropolitan NY Hurricane Transportation Study 1995). Even a powerful nor’easter can cause serious damage in NYC, and the most recent severe flooding incident occurred in December, 1992. Seawalls around the city are mostly only a few feet above normal high tide levels, so a relatively modest peak storm surge of 4.3 ft during that storm flooded into and shut down the subway system for several days. The funnel-shaped coastline offshore can focus and build a storm surge to a greater height, and the two water pathways through New York Bay and Western Long Island Sound can cause a merging surge that is difficult to predict. As one part of a project called Consortium for Climate Risk in the Urban Northeast, we are quantifying storm surge risk in NYC, Philadelphia and Boston, in our current climate as well as future climate with sea level rise. Climate change is likely to increase the storm surge threat due to sea level rise and also potentially due to ocean warming, which may (or may not) increase the number of intense coastal storms. Sea level rise has proceeded at a rate of 1.8 cm per decade over the past century, but is projected to be between 5 and 30 cm per decade in the 2080s. Even conservative sea level rise projections, when combined with historical storms, can triple the frequency of key planning metrics such as the 1 in 10 year coastal flood event (Horton et al., 2010). Storms occur infrequently, so it is useful to use computer simulations of thousands of storms and the ocean’s response, to understand flood probabilities. We are running storm surge simulations using the ocean model sECOM, the Stevens Institute version of the popular ECOM (Estuary and Coastal Ocean Model). Coastal water level predictions are available for the New York and New Jersey, and Connecticut coastlines through the New York Harbor Observation and Prediction System (NYHOPS) and the Stevens Storm Surge Warning System. This entry was posted in water, weather and tagged climate change, flooding, hurricane, Manhattan, model, New York City, nor'easter, risk, sea level rise, storm, storm surge, subway. Bookmark the permalink.